Frank Raymond’s father, also Frank, was a silk merchant in England and Frank junior was born in Ludgate Hill, London in 1825. He came to Australia in about 1849. In 1856 he married Mary Ann Brown (nee Tothill) in Curragong (which could be Cudgegong) Diggings near Mudgee. There is no official record of this marriage, which was not unusual in the gold fields of the time. Their first child, also without an official record, was Elizabeth born in about 1856. Arthur Rufus was born in Wellington in 1857 and Charles Francis followed in about 1859. Baby Frank arrived in 1863 in Penrith but died in the same year. In 1865, Frank Raymond bought 80 acres in Springwood, which had been offered to Thomas Smith in 1862, but who did not take up the offer. It was to be auctioned but was bought by Raymond a few days before the auction. This land stretched between what is now De Chair Ave, along the present Macquarie Rd to Homedale St, now the heart of Springwood township. He sold 40 acres of this land to William Rayner in 1876 and got formal title to it in 1878. 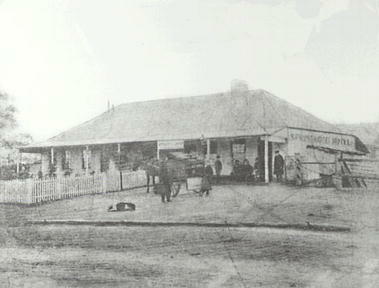 In the 1870s he built the Springwood Hotel, which also served as a small store and later offered limited postal services. In 1877, after much lobbying to the Postmaster General by Charles Moore and William Henderson, Frank Raymond was asked to act as Receiving Office Keeper at Springwood. He agreed to meet the Mail Train from Sydney which arrived at about 8pm, but not to meet the Mail Train from Bathurst which got in at 5am. The Railway Porter was willing to hand over the mail bag to the early train and Raymond began this postal work on 9 July 1877 on a salary of £5 per annum. Receiving Offices were really only safe depots for mail and usually had just a small advance of stamps to the approximate value of £5. He resigned from this position on 29 August 1878 and recommended that his successor at the Springwood Hotel, William Martyn, be appointed. In October 1876 he was one of a Committee formed to request the establishment of a school. On the sheet attached to the request a list of children of school age showed Frank Raymond nominating Elizabeth Thirdon, aged 10. His own children were well past the age of primary education, so perhaps Elizabeth was the daughter of an employee. A school was opened in 1878. Within the past few months the following cases have occurred within my own knowledge—several thefts from the Platform, one horse stolen from my paddock belonging to James Stratton and never recovered, one attempted suicide, two cases of insanity, one imbecile, besides sly grog selling and larrikinism. Unfortunately we are getting a very rough class of men around us, in the wood cutters and Bushmen, and this class is likely to be largely augmented by those who will be brought here with the object of getting sleepers for the new Railway extension. He went on to decry the actions of the bark strippers who were destroying the finest trees and the straightest saplings for bark and tie bark. He suggested that the Old Criterion opposite the Platform would be a suitable residence for a Constable, centrally located so he could watch both the road and the Railway. Sir Henry sent a letter to the Colonial Secretary supporting Raymond. He said that there were now some 30 persons in Faulconbridge and more at Numantia in the employ of Sir James Martin, Sir Alfred Stephen and Dr Badham. A Police Station was not built until 1881. In 1882, still a Springwood land owner, Raymond attended a public meeting of local land owners to consider boring for coal. He felt that the discovery of coal would be a wonderful opportunity for Springwood and was one of a committee formed to collect money to pay for the venture. He was not very successful in this and felt a Sydney meeting should be held. He himself had offered the sum of £10. This project was not continued, probably because of a lack of funds. Nothing more is known of Raymond in Springwood after this. A Frank Raymond, carpenter of 26 Pitt St Sydney is shown in the Sands Directory of 1885, and again in 1886 at the same address but with the occupation of photographer. From 1890 to 1898 he is listed as a photographer in Victoria Rd, Marrickville and in 1899 he died at the age of 74, his occupation still photographer. He was survived by his wife Mary Ann and his children Elizabeth, Arthur and Charles. His estate was valued at £166 9s 0d, which included his brick home in Victoria Rd, Marrickville which was valued at £125. Shirley Evans in The Making Of A Mountain Community: A Biographical Dictionary of the Springwood District. 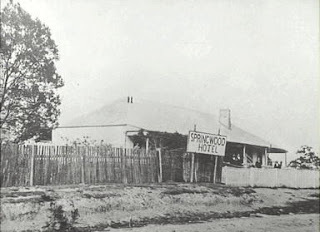 In 1877 he attempted, unsuccessfully, to sell the Springwood Hotel. The advert in the Sydney Morning Herald stated that the property comprised of 8 acres of land and the Springwood Hotel. The hotel comprised of 12 rooms, stables, a detached kitchen, servants rooms and a general store. There was a well fed well on the property and 400 assorted fruit trees. In 1889 he made another attempt to sell the hotel property, however this time it comprised of 53 acres, five of which were planted out with fruit trees and kitchen gardens. Prospective purchasers were advised to contact A.H. Ward or F. Raymond, Photographers Victoria Road, Marrickville. Sydney Morning Herald, 23.8.1877, p. 2. Sydney Morning Herald 22.5.1889, p. 4.